Mille et une nuits du baba au rhum "Au Chien qui Fume"
Le chien qui fume est une brasserie dotée d’une longue histoire et c’est entre ses murs gorgés de souvenirs que vous pouvez venir déguster de délicieux plats confectionnés avec amour. A deux pas des halles, une équipe enjouée et drôle saura bien vous accueillir que vous aillez envie d’une belle pièce du boucher ou de coquillages et banc d’huîtres, ceux-ci toujours accompagnés d’un excellent vin choisi avec les plus grands soins. Le bar de cette sympathique brasserie reste ouvert jusqu’à deux heures du matin pour les joyeux noctambules de la capitale. Service continu (tous les jours) de 12h à minuit, jusqu'à 01h le samedi. Fermé pour travaux de rénovation et ré-ouverture prévue mi-mars 2018. Our friends are regulars at Au Chien Qui Fume and recommended we check it out. We certainly weren't disappointed but thought there were a few little things that could have improved our experience. Location was great, al fresco area excellent for people watching and food was very good in general. Only gripe was the langoustine - was told they were BIG but they weren't, so not exactly value for money but fresh and sweet nonetheless. I had the Bavette (flank steak) for main and it was cooked to the way i requested and really delicious. Au Chien Qui Fume definitely warrants a second visit! Perfection! Great food, served very quickly. Excellent drinks menu, particularly the great range of beers on draft. Friendly, good-humoured service. Great location with plenty of outdoor and indoor tables. Highly recommended. Five stars. We made a last minute reservation for a large group of 10 and the staff graciously set us up at a wonderful table and welcomed us warmly. Dinner was terrific and the service was superb. A little pricey but the quality was good and we left very satisfied. Definitely recommend ! We enjoyed the traditional French ambience. Very cold atmosphere, enormous waiting time, salmon and tuna tartar tasted horribly. When I complained about the dish, the waitress said it's a "French taste". Well, if a French taste means taste of dishwash liquid, Vive la France then. excellente table,personnel charmant rapport qualité prix incontestable................. je conseille ce restaurant. The food was good but the desserts weren’t . A resto with history and ambiance. Plenty of food. Service not that friendly but ok.
Fresh seafood platter or traditional French hot pot dish, take your pick, everything's delicious! The onion soup is a must if you're into that The waiting time was a bit long but the service was even better than expected with everyone super polite and friendly. Excellent food and service. We return every year and it remains excellent. La carte du site la fourchette ne correspond pas exactement à celle du restaurant (pas de St Jacques par exemple). Excellent service and great food. Will definitely return here on my next trip to Paris. Wonderful service, atmosphere, and authentic French cuisine. We've been several times and have never been disappointed. 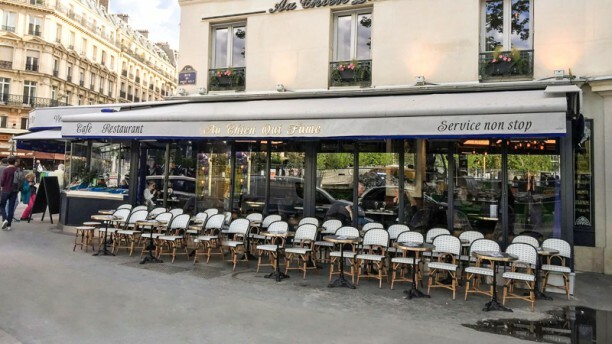 The restaurant is in a great location near the Canopee of the Les Halles. 5 miinute slow walk. The design and atmosphere are original and unique and quaint. It has inside and outside dining in good weather. We sat in the upstairs room which was very comfortable and bright (so to ready menu which has English and French). Lots of choices of traditional fare. A Reasonably price wine list was varied and appreciated. The upstairs dining area has a separate toilet facilities for those guest. We recommend this restaurant as it one of our very favorite restaurants and we always feel welcome.